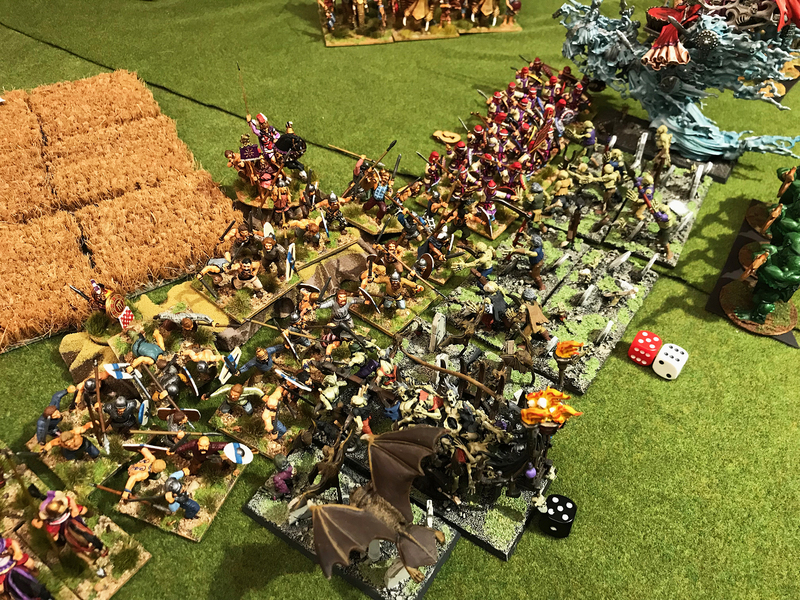 Kings of War Historical is based off of the fantasy version of the rules along with its supplements. 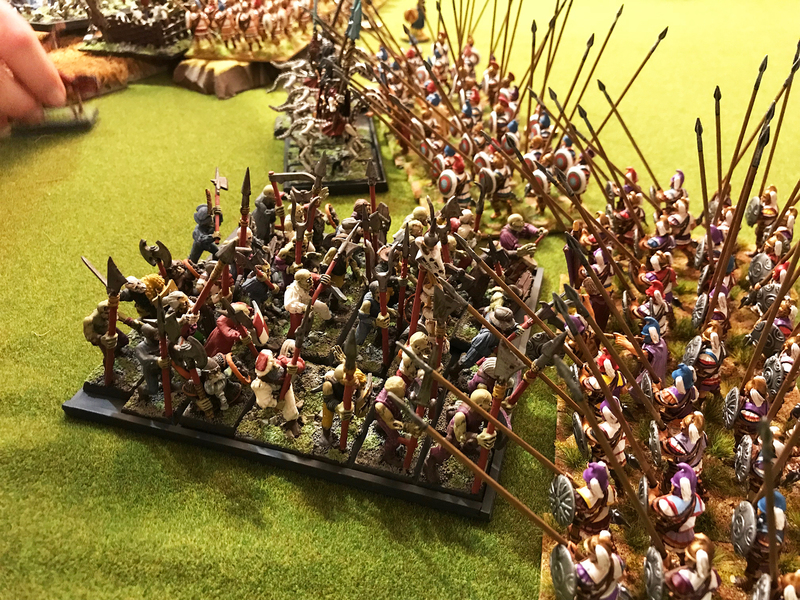 The game is element based, meaning that individual figures or stands are not removed during combat. 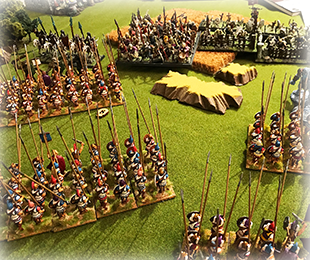 Units are usually in groups of 5, 10, 20, 40, and 60 for infantry and 5 or 10 for cavalry. 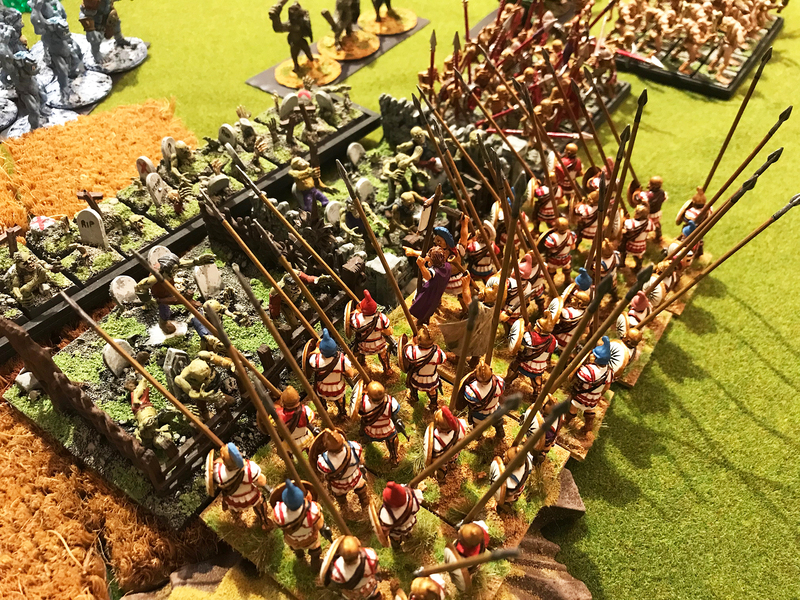 When a unit exceeds its total number of casualties, the entire unit is removed. 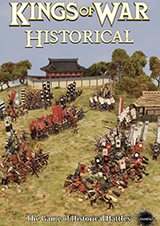 The sequence of play is move, shooting, then melee in an IGOUGO format which moves along at a very fast pace. 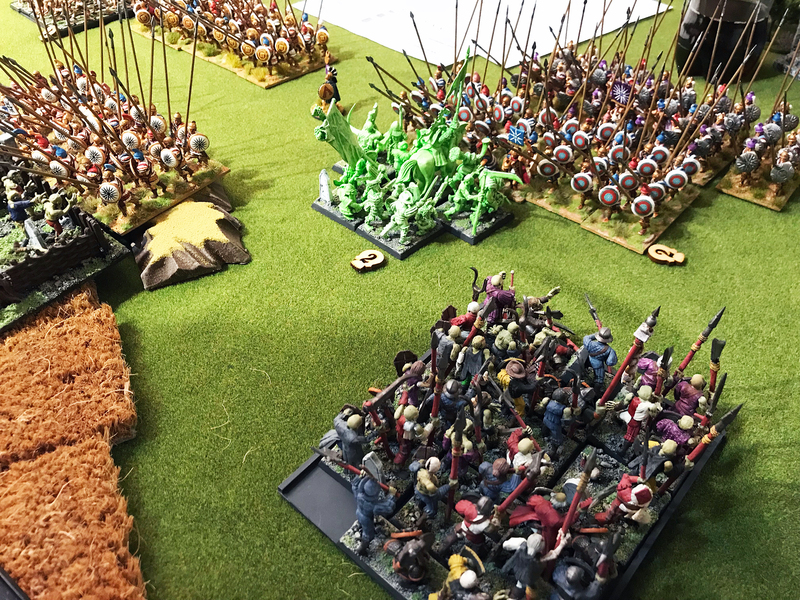 The game is designed to be able to put large numbers of figures on the board, yet conclude the battle in under 2 hours, which it succeeds. 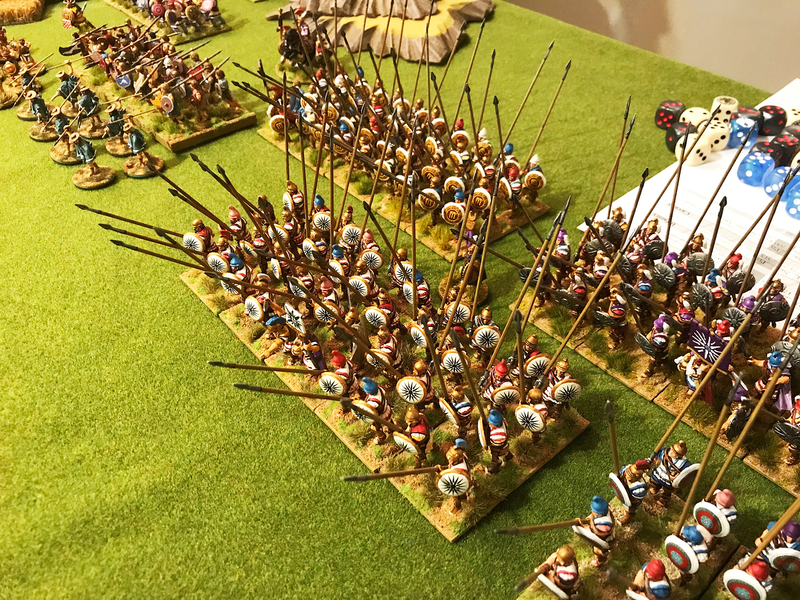 The historical version has army lists for most of the well known armies, such as Romans, Greeks, Persians, etc., and there are a large number of generic units that should be able to fit the existing armies of most gamers. 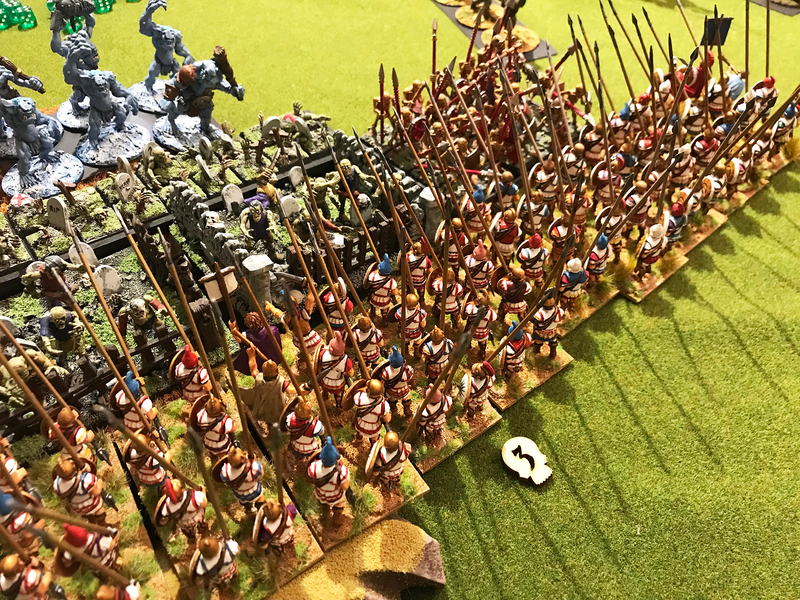 We're always looking to try something new and with my Seleucid army for Hail Caesar just about completed (but without opponents), we decided to try Kings of War since the fantasy armies can be used against historical opponents. 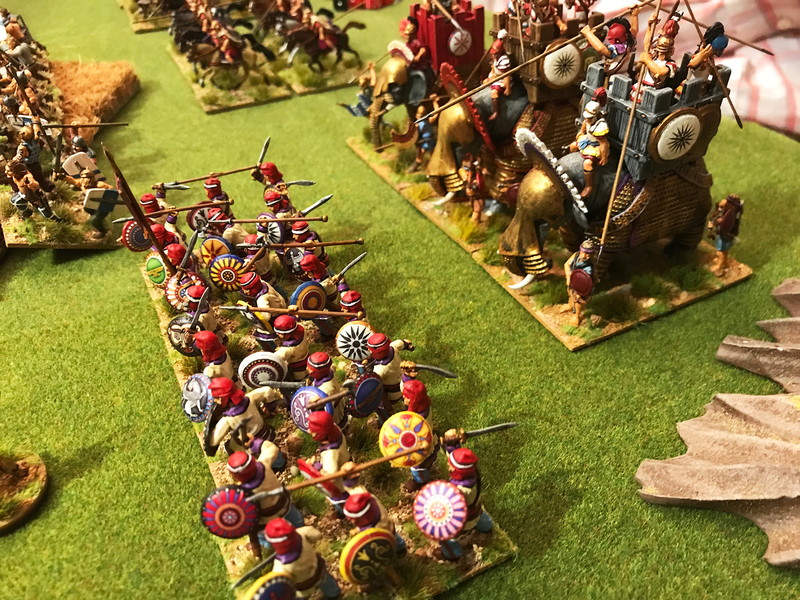 Now Seleucids against the Undead is about as unhistorical as you can get, but we were determined to give it a try. 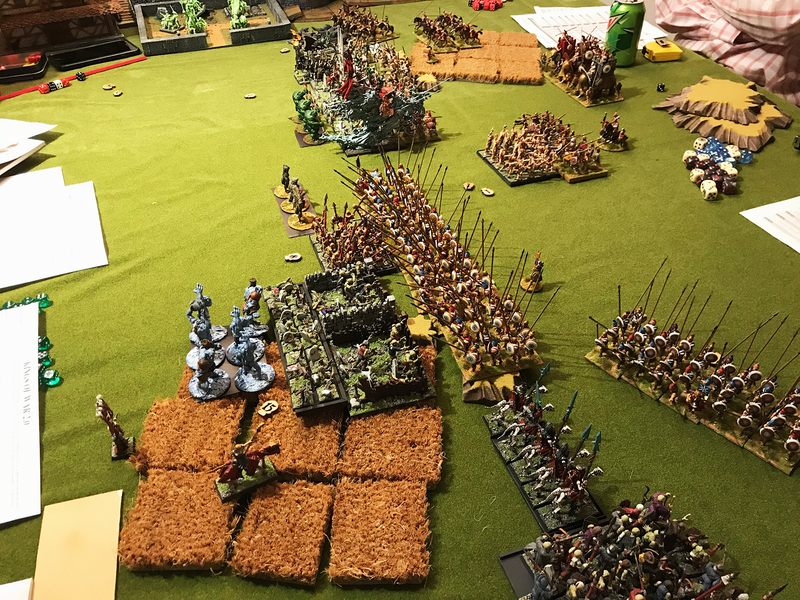 The Kings of War system is fairly easy to learn and plays fast, so by the end of the third turn everyone pretty much had things down and play was even quicker. 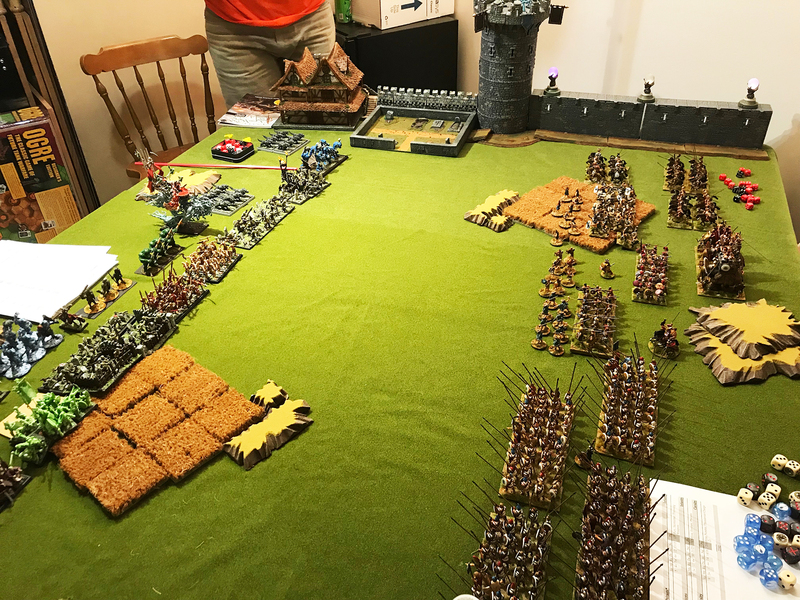 In fact we were able to get in two games in around five hours with around 2500 points per army! 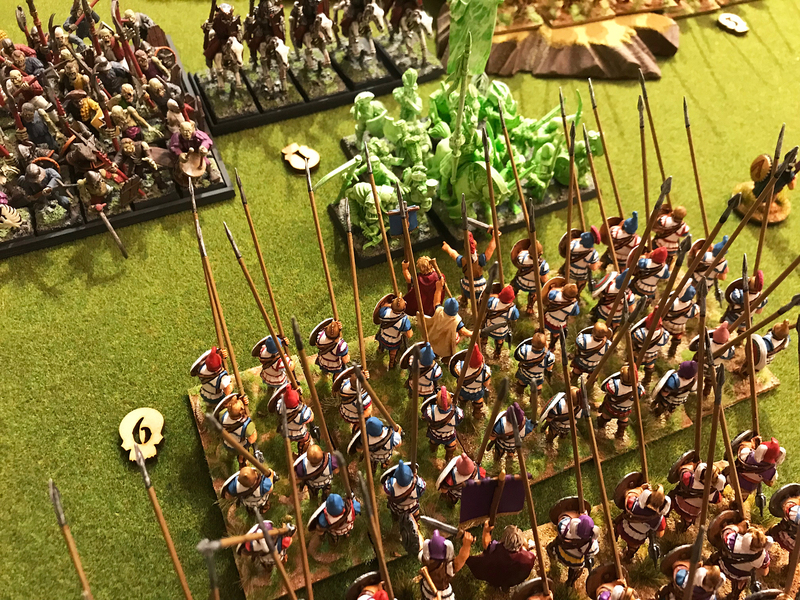 The first game was definitely a learning experience where everyone was trying to figure out the right combination, but the Successor pike phalanxes and heavy cavalry proved their worth, pretty much crushing everything in their path. 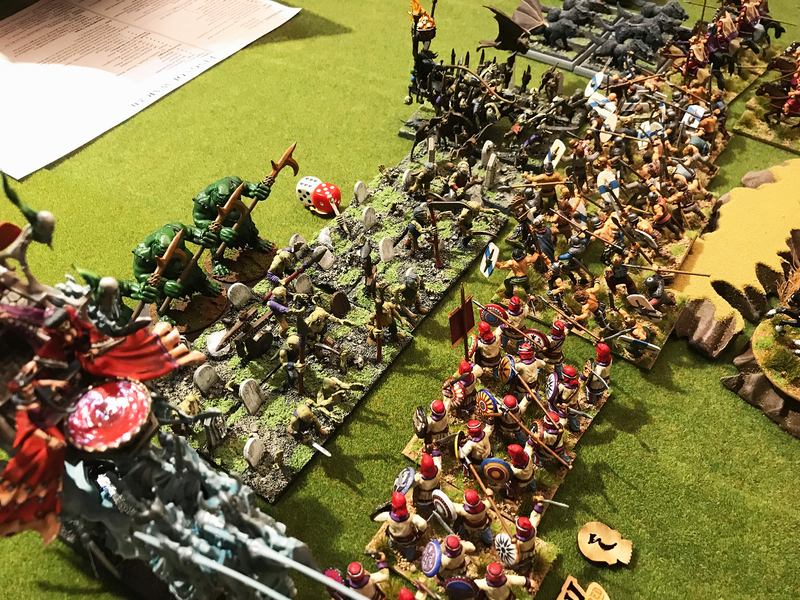 In the second game the Undead players used different tactics and were on the verge of victory when we had to wrap things up. 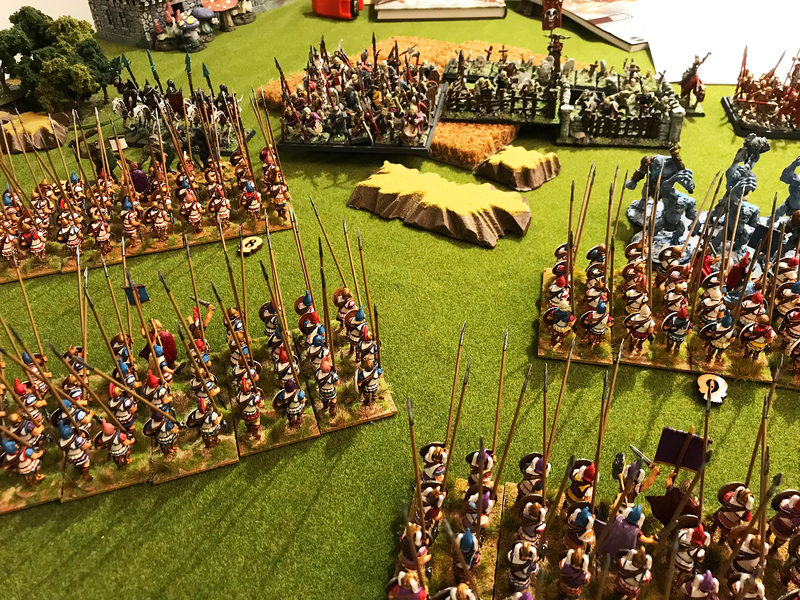 There are some quirks with the KOW system, but it plays fast and everyone had a lot of fun, so I think it was a pretty successful rules playtest for us. 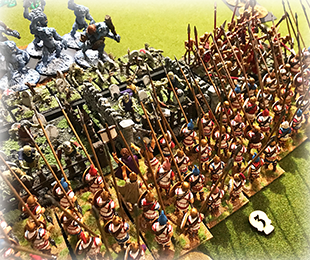 We're definitely interested in trying the KOW system with historical opponents and compare it with Hail Caesar.